SUMMER SPECIAL! RELAXING BEACH! GREAT GOLF! SUNSET VIEW FROM YOUR DECK AND BEDROOM! 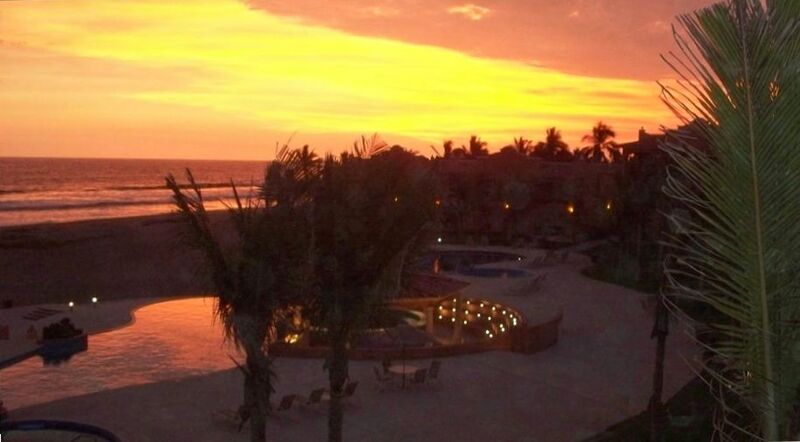 Enjoy the magnificent sunset view from the living room and deck of this topfloor luxury condo in Estrella Del Mar. The master bedroom has a kingsize bed and a deck overlooking the view of the huge infinity pool, the beach and the ocean. Leave the sliding door open and go to sleep to the sound of the surf. WE PROVIDE THE AFFORDABLE LUXURY YOU ARE LOOKING FOR. For instance, there is beer in the fridge when you arrive. Other extras include yoga mats, boogie board, binoculars, free weights, books and DVDs on the shelves, recipes for seafood cooking, extra beach towels, new 350-count sheets, ipod speakers so you can enjoy your own music, maps, directions etc. We love this retreat and we try to ensure our guests do too. We leave staples in the kitchen such as sugar, flour, many spices, butter, coffee, ketchup, salsa etc. We just ask that if you use something up you replace it for the next guest. This consideration has worked well for our guests-Please see our guest's comments. This is a super RELAXING tropical retreat--you can turn off the demands of the outside world completely, lie by the pool, stroll the lengthy beach and dine at the clubhouse if you like. There is also a lovely restaurant at the Estrella Del Mar hotel located within the resort grounds. While staying at the condo you can stay connected via the wireless internet service, boogy board in the surf, kayak, horseback ride, or golf, golf, golf on the Robert Trent Jones golf course. Everything has been arranged for your convenience. You can even pre-order your groceries so they are in your kitchen when you arrive. So... pack your swim suit, some walking clothes, some books and maybe a favorite CD, and have some fun .... (You probably want your golf clubs, sunglasses and your camera too.) We even have some favorite shrimp recipes available for you to try in the kitchen (Mazatlan is the shrimp capital of the world). In the evening you can toast the sunset from the balcony, have a soak in the hot tub and go to sleep to the roar of the surf. When you're ready to explore, go down to Stone Island where you can rent horses or kayaks, go to Old Mazatlan or the Golden Zone to shop, or venture off to a nearby mountain village. There are maps in the condo. The food ranges from easy to gourmet (without the price tag) to casual. Dine at Estrella Del Mar's oceanfront restaurant under a palapa (great Margaritas) or at Kuchupetl's famous seafood restaurant in Villa Union (very casual but incredibly good), or feed the family easily in your granite kitchen with GE Profile appliances. This is truly the perfect vacation getaway for you and your friends or family. The people at Estrella Del Mar are very welcoming. We love the ocean, the pool, the golfing, the food, the shopping and sightseeing and THE SUNSETS! The weather is WONDERFUL (80-90) when our weather in North America is not. We love the people here and it is quiet, warm, secure, and beautiful. Of course we also enjoy walks along the beach, exploring nearby villages, fantastic seafood and the golfing! We have a good collection of movies, music, recipes for seafood, and some books which we encourage our guests to enjoy together. We also have a boogie board and binoculars here for enjoying the surf. Our sunsets from the deck of our condo are fabulous. The turtle sanctuary offers unique opportunities to observe the giant sea turtles laying their eggs (in August and September) and to release baby turtles into the sea (primarily in November, December). toilet, tub, shower, Complete with shower rod to hang wet swimsuits etc over tub! Take the EDM shuttle to downtown MZT or Stone Island any time. Roundtrip for 4 to MZT is $48. Have a nice evening out and don't worry about driving home at night. Enjoy the luxurious feel of a gated community with clean water, books, friendly guests and helpers--all within walking distance of infinity pools, the beach & golf. Excellent restaurants, gym & spa. Watch dolphins and whales and even Manta Rays from the deck! Fabulous sunsets! The photos are from our deck. You overlook the gorgeous pool and have an expansive view of beach, surf, ocean. The entry to the condo looks out the back toward the golf course. The spare bedroom enjoys this view. The photos say it all. Breathtaking. You can walk for hours on the beach--in either directions. We have found many sand dollars, spotted dolphins, whales and even schools of manta rays. Large modern washer and dryer in unit. Underground garage keeps car cool. Elevator to 3rd floor. Shopping carts available in garage to help transport groceries to unit. wifi most of the time. sometimes needs direct connection. Yoga mats and weights included. Body board for the adventurous. Poolside yoga during winter season. A drip coffee maker and a Bialetti espresso maker. We stock oil and vinegar and some spices. We leave staples for our guests and they have been kind enough to restock before leaving. Everything we can think of that you might need. Granite countertops, travertine floors. GE Profile and Maytag appliances. Includes dishwasher-fully furnished. Beautiful round table inside; outdoor dining on deck facing out to beach and ocean. Library of books and videos. Also more books available on first floor at the office in the center of the central building. Ipod speakers available--bring your favorite music. We have started a collection of books and videos--please feel free to add to it! Available for rent at Stone Island. Also beach restaurants, horses and parasailing there--just down the paved road. Makes a great day outing. Beautiful deck to eat and enjoy the sunset. There are 2 courts available near the hotel. One is being used for pickle ball these days. Beautiful championship Robert Trent Jones Jr course that currently hosts the Latin America PGA golf championships and qualifying events. 5 holes along the water. Excellent prices! We really enjoyed our stay at EDM. Beautiful pool and nearly private beaches. We're not golfers but I can see why golfers would love this location, too. Condo is beautifully furnished and well-equipped. We're coming back! Estrella Del Mar has become our go-to destination. This was our 5th trip to EDM and Mazatlan. The remote nature of the resort allows you to get away from the hustle and bustle of the Golden Zone - about a 30-minute shuttle provided by the resort to get there. David and Bonnie were wonderful to work with - very responsive as owners. And the property was a relaxing joy to spend our 2 weeks. Highly recommend! Thank You! We're so happy when someone enjoys EDM as much as we do! A clean unit with all the necessary essentials! Thx! Hope to see you again! My wife and I really enjoyed out stay in this condo. It met all of our expectations. The condo offered an excellent view of the ocean and pool. The pool was very relaxing and we enjoyed it daily. We also enjoyed our daily walks along the ocean. The people we met were very friendly and very supportive. Plus the condo offered all utilities for a comfortable stay. This was a beautiful location for our honeymoon! Our experience at this condo in Estrella del Mar was lovely!!! The condo was nicely decorated, spacious and clean. It had everything we needed. The kitchen is fully equipped and it has a washer and dryer which let us pack lightly. Dave and Bonni thought of everything prior to our arrival. They sent a welcome packet to us prior to our trip filled with directions and information pertinent to our stay. They also have more information available in the condo such as restaurant recommendations, excursions, etc. The pool was magnificent overlooking the ocean and we also enjoyed long walks on the beach. We rarely saw anyone on our walks...we even got to rescue a few baby turtles! We enjoyed the hotel restaurant and staff. The food was amazing and very inexpensive. It's just a short walk down the beach. Having groceries delivered prior to your stay would be a bonus. We used the shuttle at the hotel to go into Mazatlan for the day and also to get groceries at Walmart. The weather was in the low 80's which was a bonus for us coming in from snow in Seattle! We had a lovely honeymoon---thank you Dave and Bonni for sharing your little piece of paradise with us! I love to hear about it when someone enjoys their stay as much as we do when we stay there! Loved our week at your condo. It was practically deserted so we had the pool to ourselves most days and it is a beautiful pool. We didn't have a car which we will have next time. We got our cab driver to take us to town with a grocery store on our way from the airport. We picked up some staples mainly for breakfast and that was fine. We took our golf clubs and the staff at the golf course were wonderful. They came and picked up our golf clubs and stored them at the golf course for the week. It was a beautiful 10 minute walk down the beach to the golf course which we enjoyed every morning. We golfed 18 holes the first day at 7:00 a.m. but found it too hot after about hole 14 so only played 9 holes after that. The golf course is very well kept, very scenic and quite challenging. We usually had something to eat at the golf course before walking back to the condo and going for a swim. The beach is beautiful and great for walking. Saw all sorts fish, manta rays, dolphins in the water and all the little crabs and birds along the beach. The hotel is the other way down the beach and we went there for dinner. Very nice and reasonably priced. A few times we just picked up a salad and a bottle of wine to go and ate at the condo. A couple we met had a car and picked us up some fresh shrimp and fish from the market. Best shrimp ever and cheap!!! Had enough for 3 meals for about $10.00. Food at the golf course is very good as well. Free chips and salsa with our drinks. They even turned the hockey game on for us. It was actually nice not having a car but need one to get the fresh sea food market. The condo itself is beautifully furnished and very comfortable. We spent most of our time on the balcony and the sunsets are spectacular. Bonni and Dave are very accommodating and easy to deal with. We only had one minor glitch with the hot water but it was very easily fixed with a phone call. Looking forward to our next trip. Thanks Bonni and Dave. Thank you for the thorough review--so glad you enjoyed yourselves! The shrimp is really amazing, isn't it! And the golf course too! I agree that a car is nice to have--I believe Enterprise will bring one out to you and then you can use the road to Stone Island and the foot ferry and a Pulmonia to go shopping if you don't want to drive in downtown traffic. Stay warm through the rest of the winter! Holiday rates are higher. Rates are for 2 people. There is a $20/night additional charge for up to 2 additional people.